Under method 1 (i.e., recognition of gross revenue method), the joint production cost is not apportioned to the by products. This method overstates the cost of main product because some portion of joint production cost belongs to by-product but the whole production cost is also allocated to the main product. Approach-a: The sales revenue of by-product is listed on the income statement as other income. Approach-b: The sales revenue of by-product is listed on the income statement as additional revenue. Approach-c: The sales revenue of by-product is listed as a deduction from the cost of goods sold (COGS) of the main product. 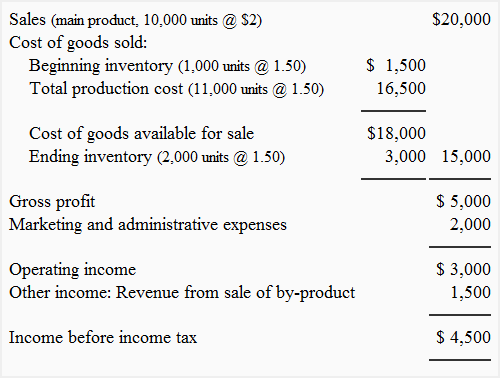 Approach-d: Sales revenue of by product is listed as a deduction from the total manufacturing cost of the main product. The following example illustrates all of the above four treatments of by-product’s sales revenue. 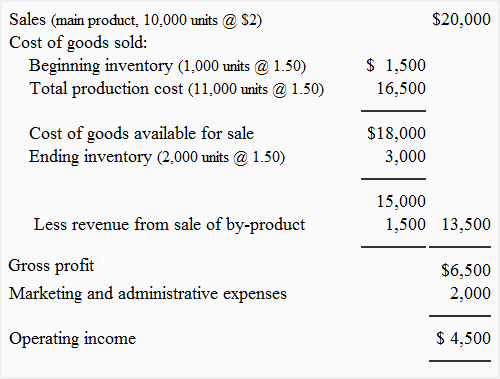 In the above income statement, the $1,500 revenue from sale of by-product is shown as other income below the operating income of $3,000. It results in income before income tax of $4,500. Notice that the by-product revenue is deducted from the cost of goods sold (COGS) in the above income statement. It results in a reduction of COGS from $15,000 to $13,500. 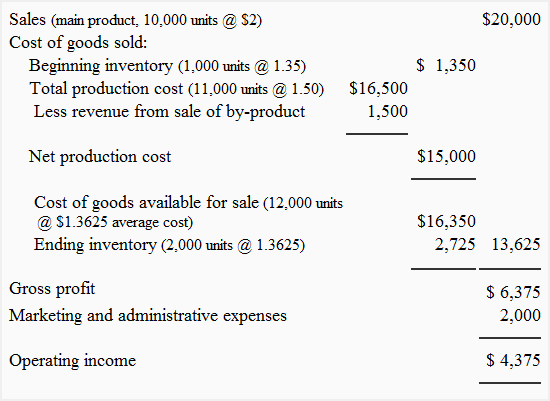 In above income statement, the by-product revenue is deducted from the total production or manufacturing cost of $16,500. This treatment results in a net production cost of $15,000 (= $16,500 – $1,500). 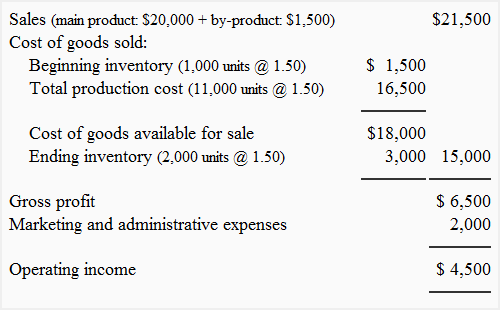 The cost of goods available for sale is $16,350 (= $1,350 + $15,000) which is used to compute a revised per unit cost. The revised per unit cost is $1.3625 (= $16,350/12,000 units) which is used to compute the ending inventory cost of $2,725 (= 2,000 units × $1.3625). Similarly, a reduced beginning inventory cost ($1.35 per unit in the above income statement) results from crediting the sales revenue of by-product realized in prior period to the production cost of the main product incurred in prior period. The above approaches do not involve in making any complex journal entries. Under first three approaches, the cash account or accounts receivable account is debited by the sales revenue of the by-product and income from sale of by-product is credited. Under fourth approach, the cash account or accounts receivable account is debited by the sales revenue of the by-product and the production cost of the main product is credited.